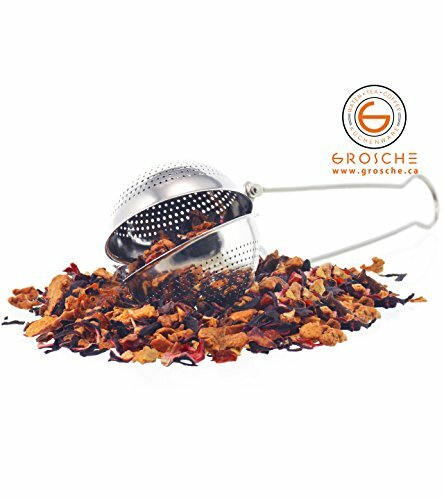 The Grosche Torch Tea Infuser is perfect for 2-3 cups of tea. Simply open the spoon by pressing the two arms together, scoop up some tea, and it snaps shut as you loosen your grip. Then, just let it steep in your cup of hot water. The Grosche Torch is made from 18-8 stainless steel. LARGE CAPACITY - Large single cup serving is perfect for letting your tea full expand and breathe. Fill it up to one third or half way with your favorite tea for the perfect cup every time. You can even use it in a teapot or kettle to make more than one cup. works well with most leaf teas including green tea and some finer herbal teas. Reduces floaties and tea debris in your mug and unwanted leaves floating in your cup. No need to filter your tea. Works perfectly with both iced and hot tea. Even works with coffee. EASY TO USE - Simply squeeze the handle to open, measure and fill with your favorite tea leaves, and steep with hot water. Now you can replace your old tea bags and enjoy drinking fresh full flavored tea.